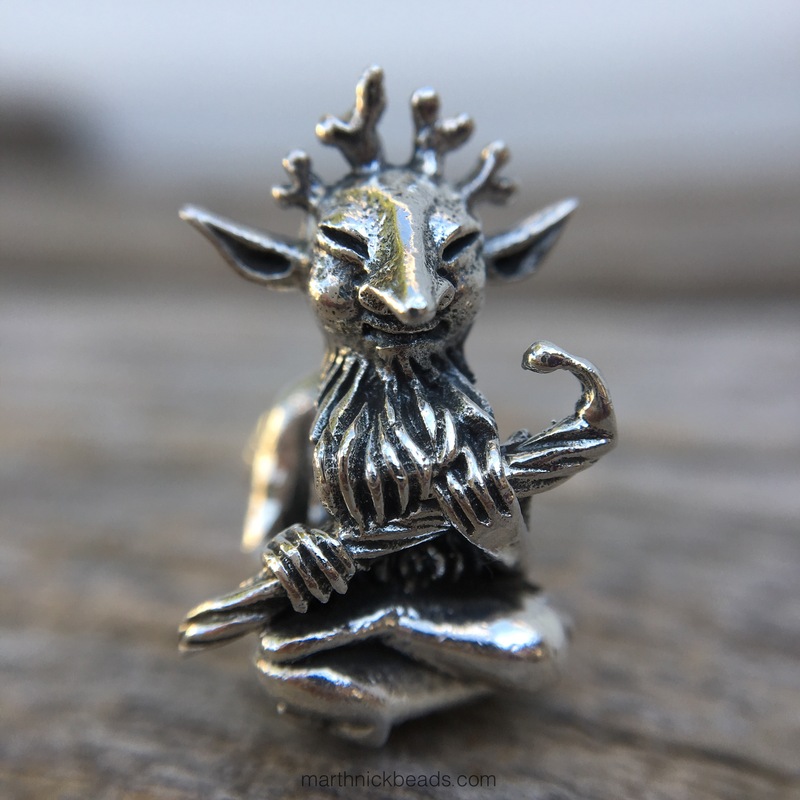 This silver Tree Goblin came out as part of the new Enchanted Glade Collection by Redbalifrog. The detail on him is incredible! Here he is from the side. I love the detail on his wings and bottom. Here’s a video as it’s easier to see this way. I think I’ll put on more little videos like this as it’s a great way to get a feel for how a bead looks in real life! Redbalifrog beads often make me think of using the soft, natural colours of True Beadz. I tried taking a picture in one of our trees but there were ants everywhere and the light was all wrong, so I gave up and just stood near some plants. Bugs freak me out! 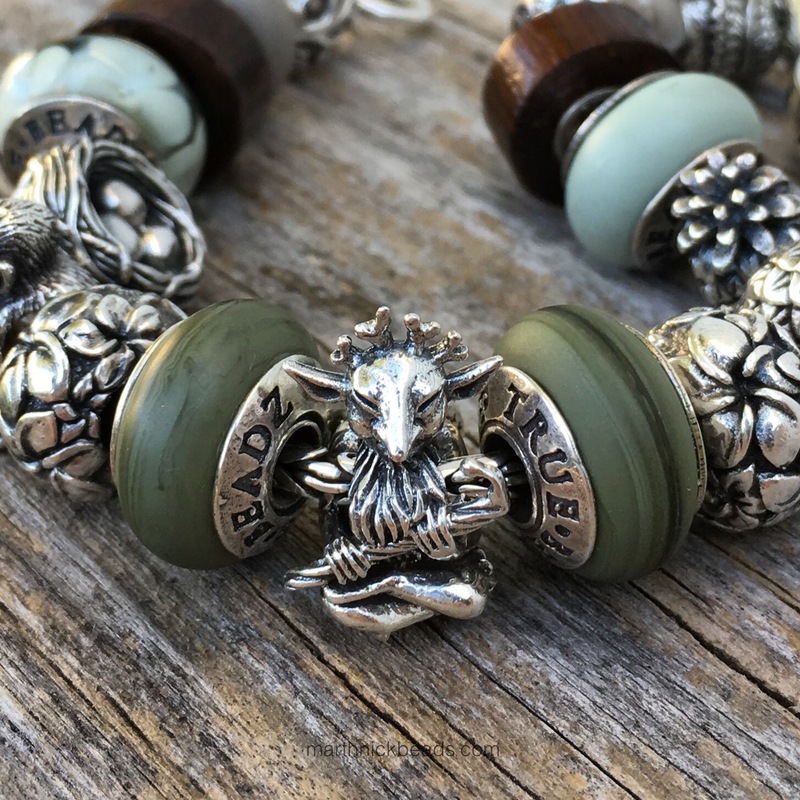 The True Touch Dragon Green beads play nicely with a tree theme. 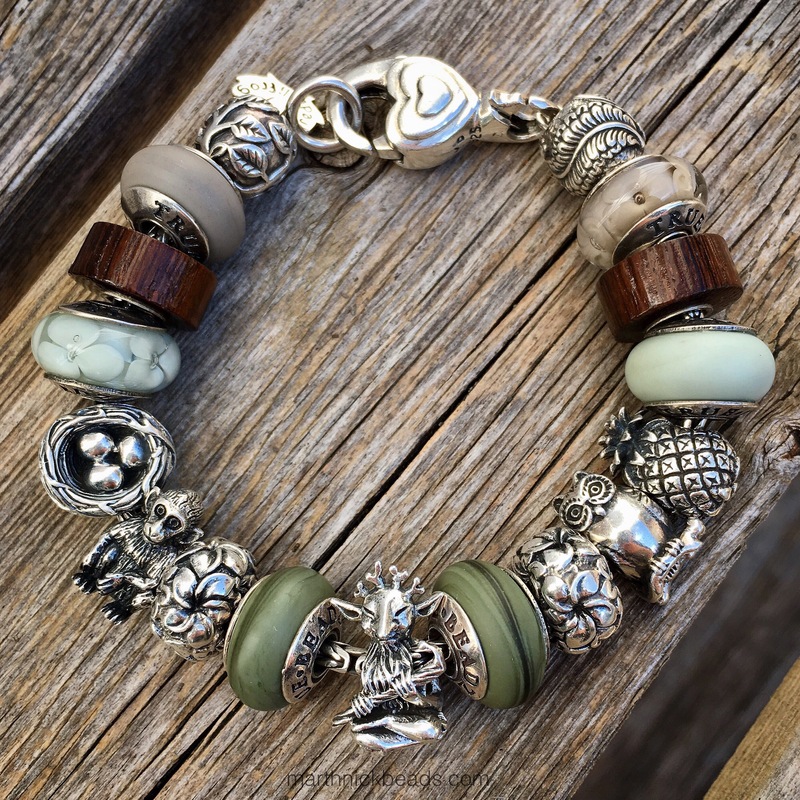 All the silver beads, lock and bracelet are Redbalifrog. 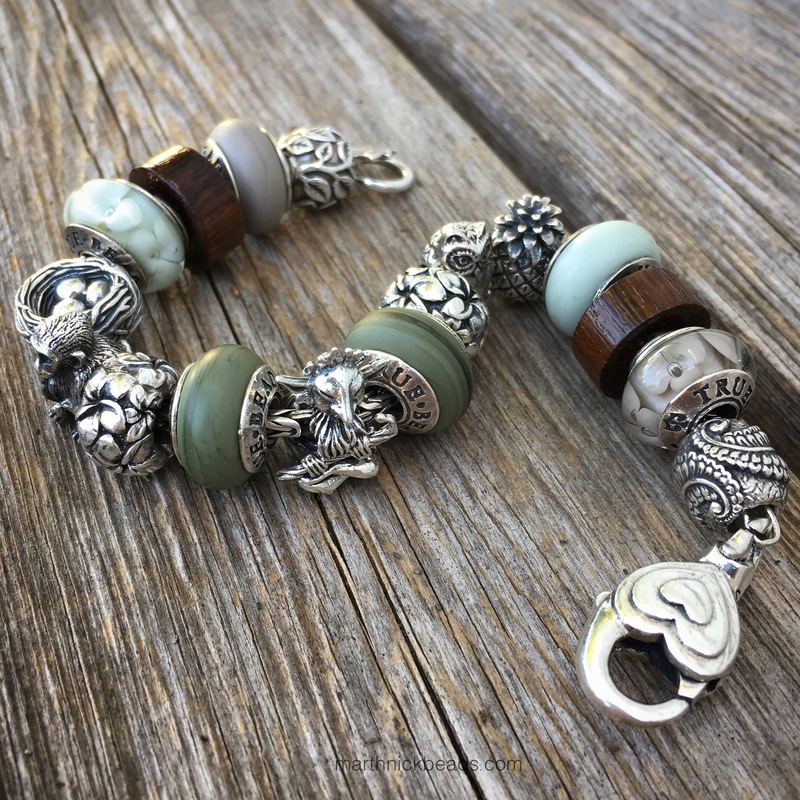 The glass beads are all True Beadz and the wood ones are from Ohm Beads. Below left to right are Tree of Life, Touch Castle Stone, Bolly Wood, Blossom Linen, The Nest and Magic Monkey. Below left to right are Frangipani Forever, Touch Dragon Green, Tree Goblin, Touch Dragon Green, Frangipani Forever and Night Owl. 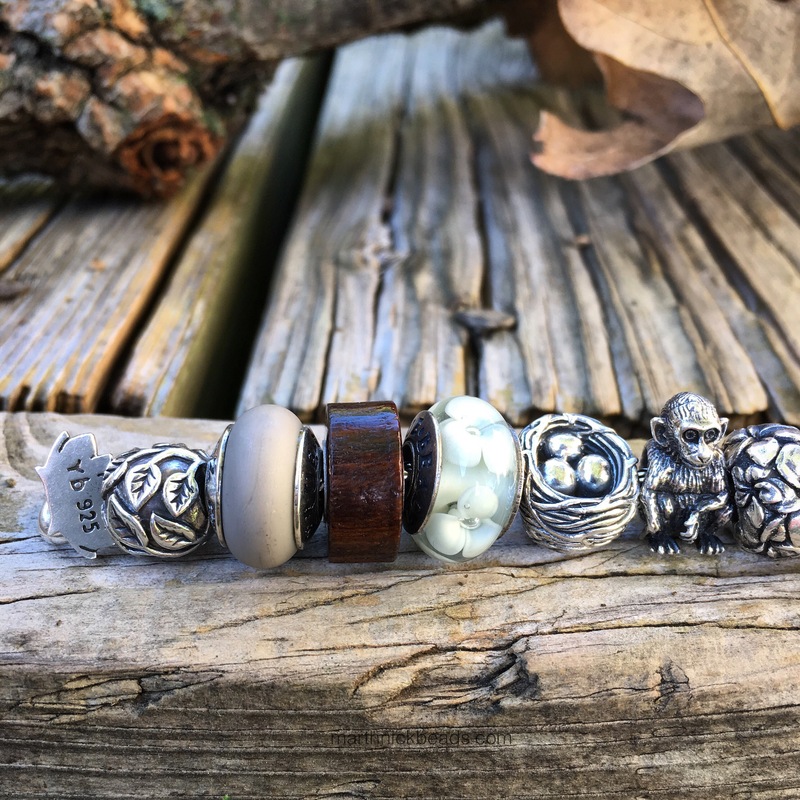 Below left to right after the owl are Pineapple, Touch Linen, Bolly Wood, Blossom Castle Stone, Fern Leaf And the Love Lock. This is the arrangement I had at first. But after I took all the photos I switched it to this, which I think I like better. Anyway, I know I use the combination of RBF silver with these True Beadz colours a lot, but I just love them together. 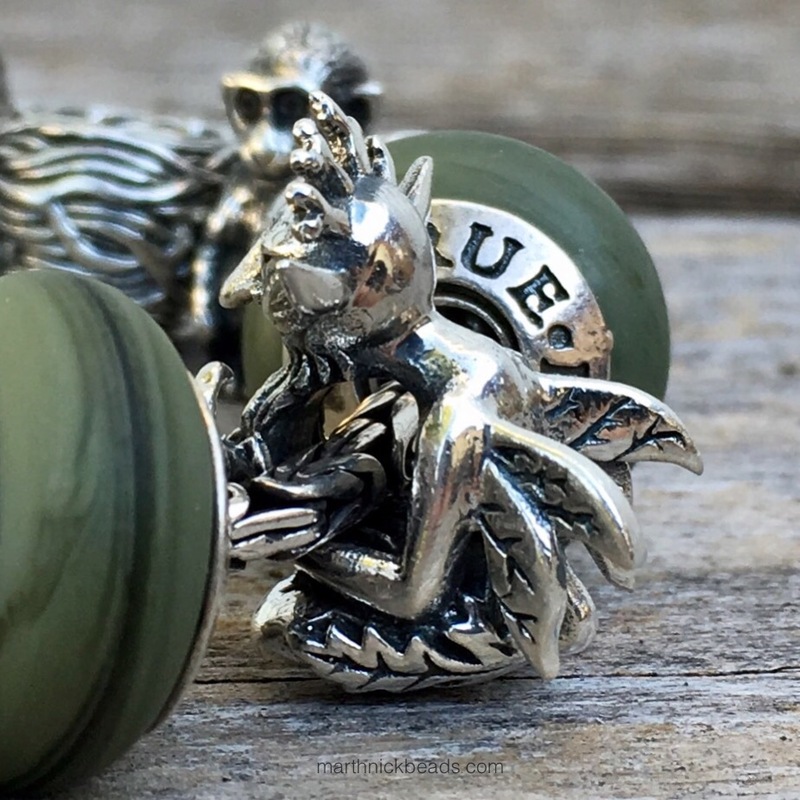 The Tree Goblin is such a magical bead and I’d love to hear if anyone has him! 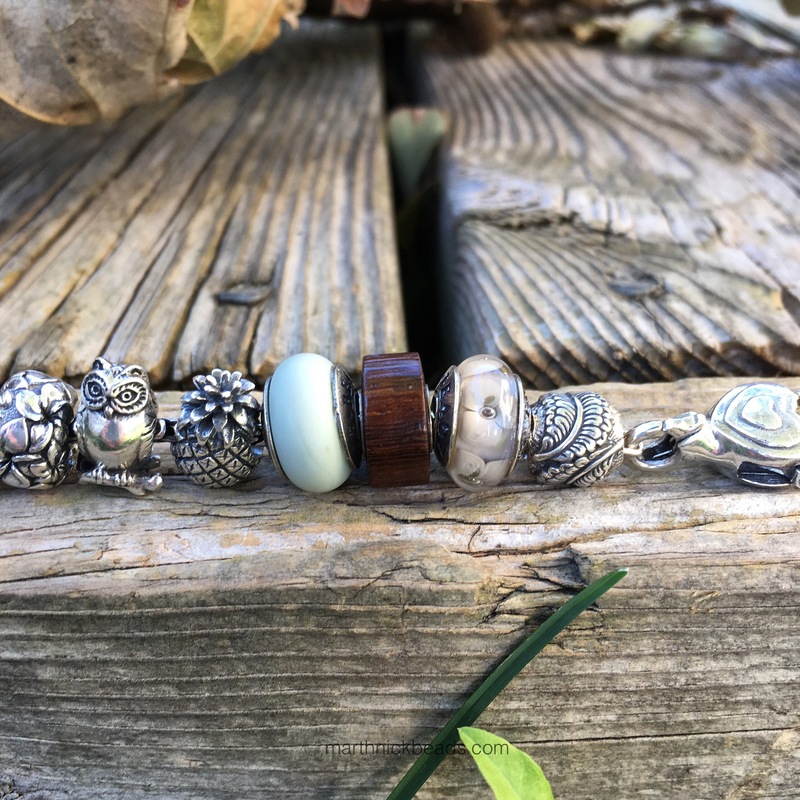 Coming up next week are the Trollbeads Calcite Rock, the Redbalifrog Owl Nest and the Trollbeads Diamond Bead, White (Ice Princess Promo). Have a great weekend! I really love RBF silvers and I am so happy I bought 2 at GL. I just now tried waving my arms about with Tree Goblin on and he mostly sits on his bottom while on the wrist, so is very comfortable. Maybe if you had a long sweater on you’d want to be careful so that nothing got snagged? You are right about the Truebeadz with the silver beads, RBF silvers are great. 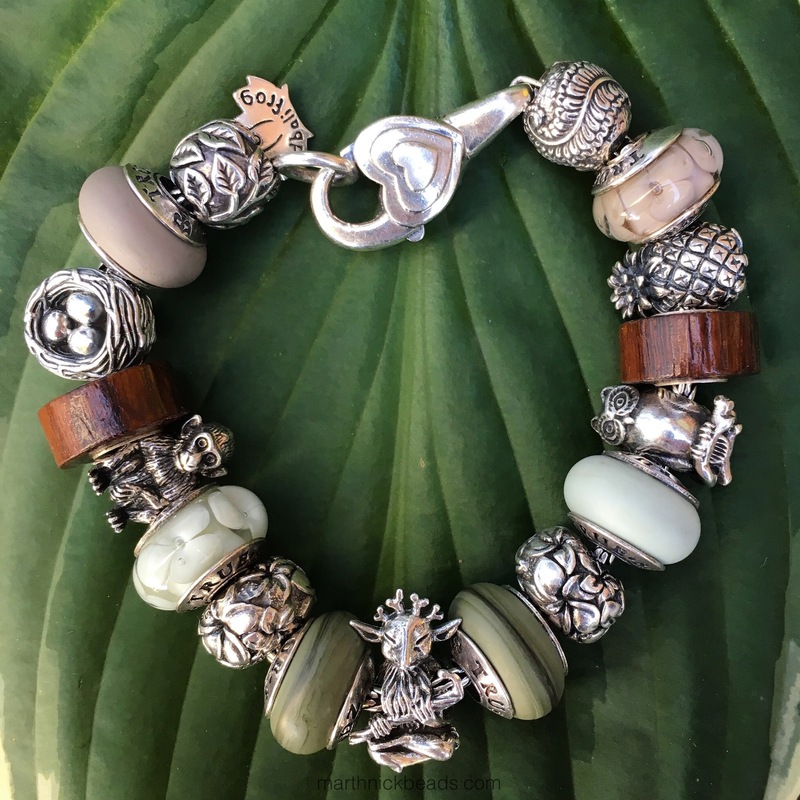 Like Charmebead, I was wondering if his lovely, leafy wings would feel spikey on your wrist? Even if they do, he’s still on #thelist ! Beautiful photos as ever, Martha. Thanks Sarah! No, wings are not pokey as he mostly sits on his bottom. Hope you have a more calm day at work! Thank-you Martha. I hope you have a lovely day. My head is always full of beads nowadays, it’s a lovely escape. J’adore les perles redbalifrog est cet ensemble est superbe. 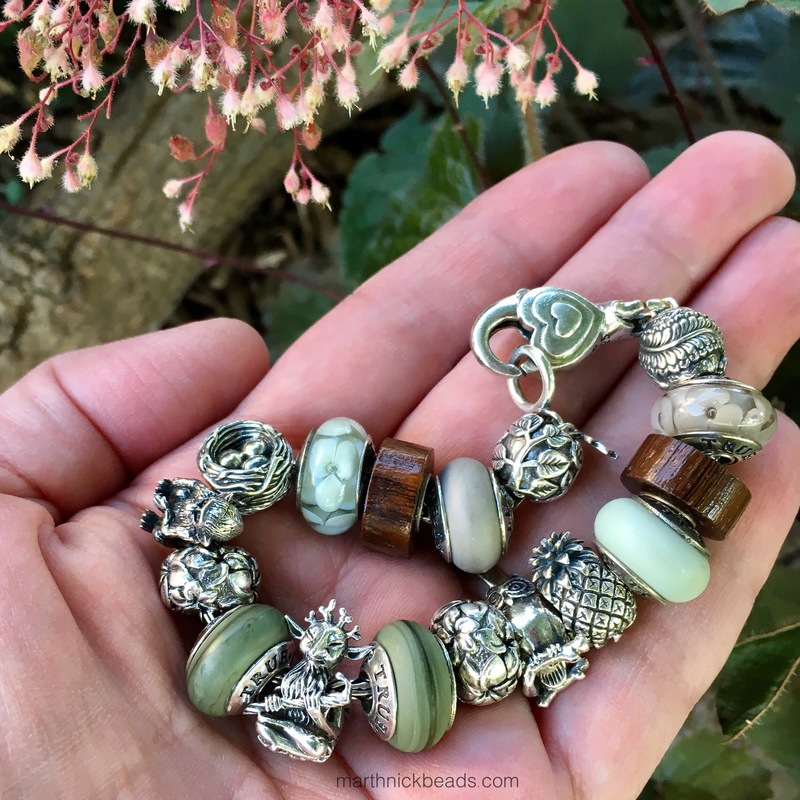 Par contre peut on mettre des perles trollbeads sur un bracelet en argent redbalifrog ? Je sais que vous faites beaucoup de melange entre les marques et je trouve cela très excitant ! Merci beaucoup Sylvie. 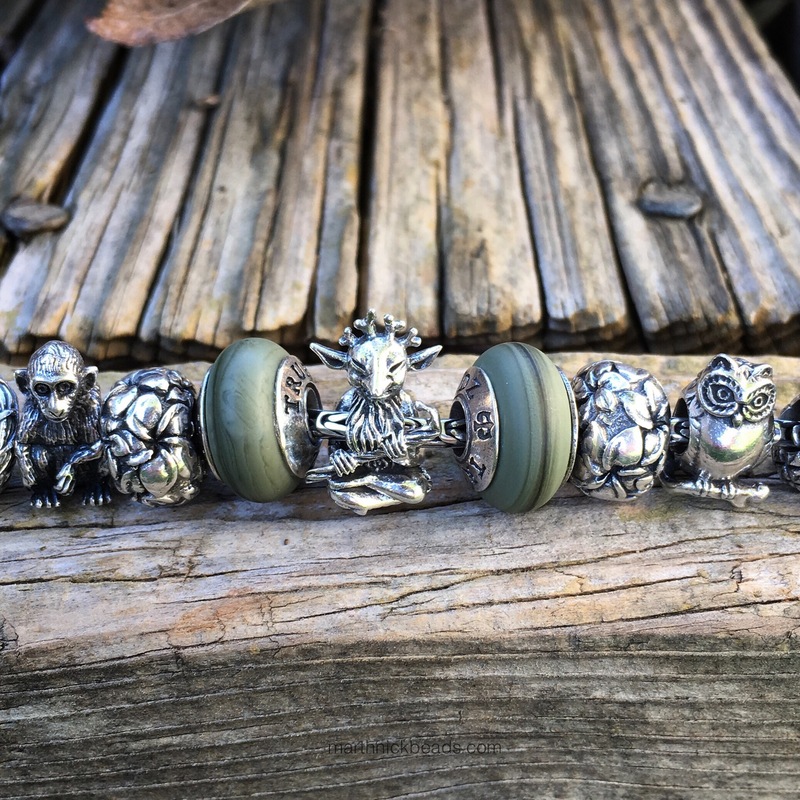 Oui, Trollbeads avez les bonnes dimensions pour un bracelet Redbalifrog. But, Trollbeads don’t fit on the Redbalifrog Snake Chain, just the regular bracelet like I used here. My bracelet is old though, so hopefully they haven’t changed the size of the latch.